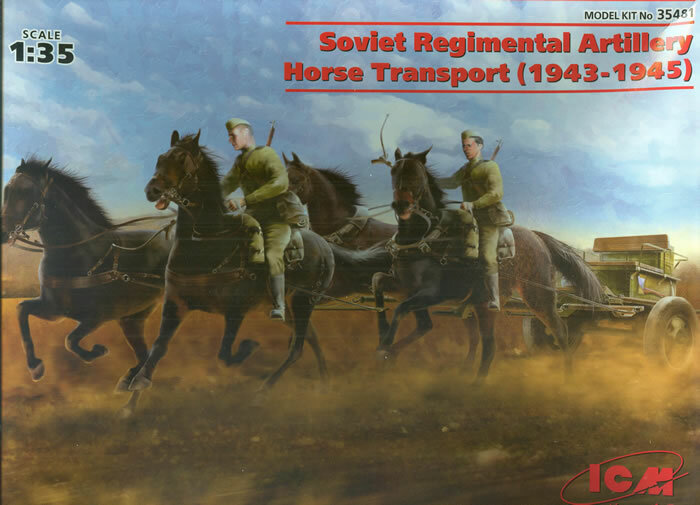 Like the Germans and many other nations, at the beginning of WWII the Red Army primarily relied on horse drayage to pull its lighter artillery pieces up to 76.2mm caliber. While very light regimental guns could get by with two horses, four was the norm as it also allowed for a fully loaded ammunition limber to be used as well. The universal limber at the start of the war was the 52-R-353 but it soon was joined by the 52-R-353M with rubber tires and the ability to be converted for either horse or motorized drayage by modifying the main arm of the limber. It had seats for two crewmen as well as room to carry about 24 rounds of ammunition. This recent kit from ICM provides for a complete set - the limber, four horses with horse furniture, and two complete crewmen - outriders. Two additional torsos, heads and arms are included but are not covered in the directions. The limber is similar to others that have been released by Miniart and RPM with the former having 121 parts and the latter only 32; this kit is similar to the Miniart one and like it includes the 52-Ch-0331 and 52-Ch-0332 horse harnesses. However, in this kit the harnesses are primarily molded onto the horses. Like the Miniart kit the tailgate on the limber is closed and there is no interior. The horses are similar in layout to those from Historex and Airfix and anyone who has ever done one of those figures will have no problems with these animals. Each horse consists of six parts - sides, head and neck, ears, and tail. The mane is molded in place and portrayed as tightly cropped. The long hair parts will do well with a bit of attention from a pyrograveur (or simply a hot pin in a pin vise) to “fluff” up the hair for a more realistic appearance. The riders are conventional in that they also consist of six main parts - legs, arms, torso and head. Headgear consists of the “pilotka” sidecap and it is molded in place. Three carbines are provided in the kit as well as bread bags, canteens and ammo pouches. Horse furniture consists of a saddle, blanket roll, stirrups and the aforementioned draft gear to connect the horses to the limber. However, no reins are included and the directions simply state “scratch build” - as noted you should have some experience with figures to build this kit. Most figure modelers have either .005" styrene strip or materials like heavy aluminum or lead foil to make straps and reins. ICM do mold the buckles and connectors in place for you at least and all you must add are the straps themselves. Painting and finishing directions are somewhat spartan and basically are keyed to a chart on the back of the limber directions. Overall, if you have a 45mm, 57mm or 76.2mm gun of either regimental or divisional type up to the ZIS-3 this offers a nice and different way to display it.